GP – RN > Brexit: Will Labour save a Tory Prime Minister From The Rebels? GP – RN > Brexit: Will Labour save a Tory Prime Minister From The Rebels?. Brexit: Labour to save a Tory Prime Minister? How ironic, Booker writes, that possibly the greatest obstacle to Britain achieving a sensible exit from the EU is that group of 60 Tory MPs who last week ganged up to oppose Theresa May’s repeated insistence that we must remain “within” the EU Single Market. According to a report on Channel 4 News, they believe that to stay in the single market would be “virtually the same as remaining in the EU”, still subject to “virtually all its laws”. So blind are these hardline Brexiteers to the practical realities of what we are up against that they seem not to realise that, by leaving the EU but remaining free to trade in the Single Market as members of the wider European Economic Area (EEA), we would in fact be subject to only 5,288 of the 19,868 EU laws in force. Far from having to obey “virtually all” the EU’s laws, we would escape almost three quarters of them, leaving only those that would give us the right to continue trading within the Single Market much as we do now. 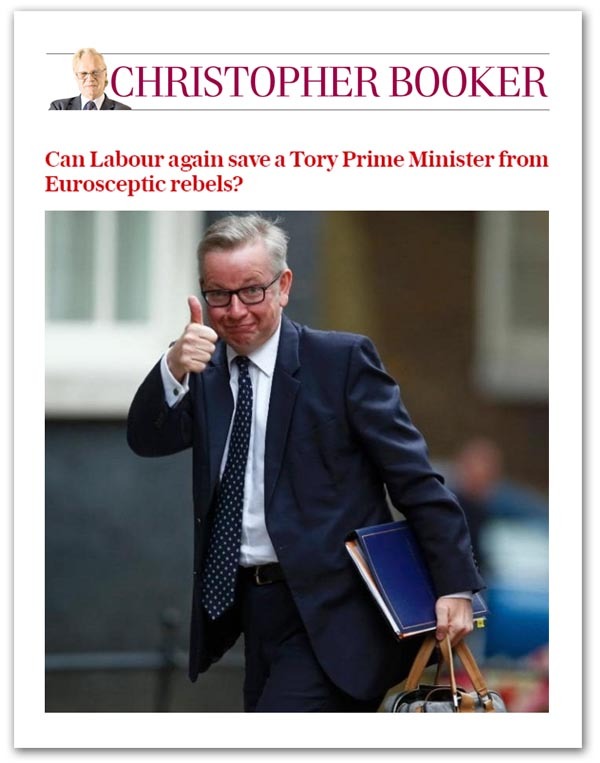 In this short piece – subject to the Sunday Telegraph’s space limits Booker can’t take this to the next level, point out that many of those laws – and increasingly so – originate at regional or global level and are simply handed down to the EU. In or out of the EU, we would be adopting them any way. And yet, this is no secret. In his 2014 speech, Owen Paterson discusses these influences. He said:As DEFRA Secretary, I was only too well aware of how these changes affect us. Many of the Single Market food standards my former department has to implement are no longer made in Brussels. They have gone up a level and are now made by Codex Alimentarius, which reports to the UN’s Food and Agriculture Organisation (FAO), in Rome. Yet we would often learn of them only after they had been handed down to Brussels and when it was too late to change anything. This is no small matter. As well as Codex, the FAO hosts two other standard-making organisations, the Office International des Epizooties (OIE), which deals with animal health, and the International Plant Protection Convention (IPPC). Both fix standards which are adopted by the EU as Single Market legislation, only then for it to be passed back down to us. Once they are set at international level, Brussels does not have the power to change them. I was particularly struck on a visit to New Zealand 18 months ago how my counterparts saw how vital it was to build alliances and work with like-minded nations to promote legislation or amend other countries’ proposals. At that time they were particularly exercised about a specific proposal on the OIE affecting the sheep industry crucial to NZ farmers. They were particularly pleased to have got the Australians on side and believed that gaining the support of Canada and the US would see a key amendment through. When I asked why they had not asked for the UK’s influence on this matter, they said that the UK’s position was entirely represented by the EU: even though we have one of the largest sheep flocks in the world. I left feeling stung by these comments and totally disheartened by our lack of influence but also galvanised by the belief that we could serve our own industries so much better if we, as a sovereign nation, retook our rightful place on these various global regulatory bodies. Similarly, Norway’s position is abusively dismissed as simply submitting to EU law by fax machine. Norway is a member of the EEA, the area of the 28 EU member states and the three EFTA states. Norway has a huge fishing industry and plays an enormously important role in promoting regulations concerning fish in Codex. The fact that when a regulation is finally agreed, it is formally disseminated to all members of the EEA including Norway, is wholly irrelevant to their key role in negotiating the detail alongside the EU. Once the regulation is agreed at international level by Norway and the EU it cannot be changed by the EU. Norway makes representation to Codex by itself, and the UK could do the same. These are regulations we will need to submit to either way, so why not submit to them having had a decent chance to influence them as Norway does? The range of international standards shaping the Single Market acquis is staggering. In the all-important car industry, for instance, the regulatory focus has moved from Brussels to Geneva. There, the EU’s Single Market standards start as “UN Regulations” produced by the World Forum for the Harmonisation of Vehicle Regulations. Known as WP.29, it is hosted by the United Nations Economic Commission for Europe (UNECE). European vehicle production is extraordinarily integrated; the UK produces 1.6 million cars but produces 2.6 million engines. Most of these engines are exported to Europe. As we move to world standards of vehicle production we would be at a massive advantage if we were directly represented, on the body influencing standards, in our industry’s interest. Then there is the regulation affecting the financial services industry – which is of such great importance to the City of London. In the past, much of this was made in Brussels. Now, most of the important rules come from the Basel Committee on Banking Supervision. As important is the Paris-based Financial Stability Board (FSB), chaired by Mark Carney. Founded in April 2009 by the G20 and working with the OECD, it has a mandate to coordinate national financial authorities and international standard-setting bodies. It is also tasked with developing and promoting the implementation of effective regulatory, supervisory and other financial sector policies. In the past, Ministers had to travel to Brussels to make their case, and to keep an eye on new laws, but with the advance of globalisation we now need to be represented in Geneva, Paris, Berne, Rome and elsewhere. Outside the EU, we would be working directly with these organisations, building alliances with likeminded nations, deciding the rules the EU is obliged to adopt – as do Norway, New Zealand and the United States.This is an optimistic and realistic view, but it says much of the “Tory 60” that they wilfully ignore what comes from their own kind. Yet, as Booker writes, any of their suggested alternatives would in one way or another be an economic disaster. Furthermore, we could hope to gain other advantages, including the right to exercise some control over immigration and no longer being subject to the European Court of Justice. A further irony is that, if Parliament is given a vote and those 60 Tory MPs choose to oppose Mrs May’s wish to remain in the single market, she might be saved by all those Labour MPs, led by Jeremy Corbyn, who want us to stay in it. On October 28 1972, also faced with a backbench rebellion by Eurosceptic Tories, Edward Heath only won his crucial vote to take us into Europe with the aid of 69 Labour MPs, led by Roy Jenkins, who rebelled against their own party to support him. After Labour MPs helped overcome a rebellion to take us into Europe, it could be Labour MPs enabling Mrs May to survive a Tory rebellion over the best way to take us out. Next Next post: Tony Blair & The Undead Rise To Destroy Democracy & Overturn BreXit!